Arsenal was at the London Colney on Friday to train ahead of their upcoming match against Bournemouth who will be at home. The gunners will be playing away from home and their last away game ended as a 2-2 draw against Crystal Palace at the Selhurst Park. Lucas Torreira was not with the Arsenal squad that trained on Wednesday but he has however returned after playing some international games for Uruguay, the midfielder was available in today’s training sessions at the London Colney. 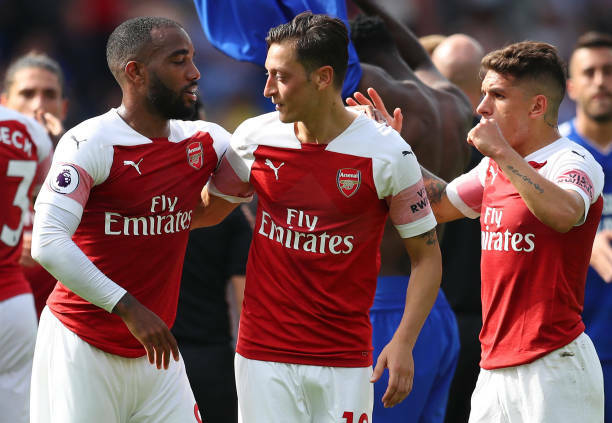 The Arsenal players had some fun as Mesut Ozil nutmeged Lucas Torreira as he was on a challenge on getting the ball from the circle full of his teammates who were passing the ball to each other. The club uploaded the video clip on its official Twitter account. One of the Arsenal fans replied; “Torreira is going to two-foot him somewhere in the next month guaranteed”. The gunners will come into the Bournemouth match with the hope of getting all the three points because the Premier League top four will go far from them if they don’t win this weekend. Arsenal fans will be hoping that Mesut Ozil puts on a good performance against Bournemouth because he has rested during the international break since he quit the Germany national team after the FIFA World Cup.